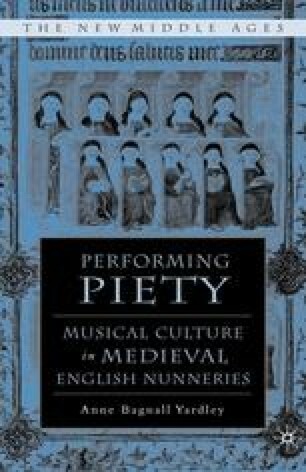 Although monastic rules and the extant liturgical sources offer a documentary view of the ideal musical practices in medieval English nunneries, such additional sources as visitation injunctions, records from the dissolution, architectural remains, and the charting of extant books from nunnery libraries provide a realistic corrective. The size of monastic houses (ranging from tiny to well populated), the social class of the nuns, the relative wealth and poverty of the establishment, and the quality of leadership all impact the character of the liturgy. While some contemporary authors express concerns about the ability of nuns to fulfill their basic liturgical duties1, the extant information strongly suggests that despite poverty and the lack of a comprehensive education, most medieval choir nuns sing the office regularly, their piety formed daily by the texts of the psalms, the poetry of the hymns, and the music of both the core Gregorian chant repertoire and later medieval additions. The ceaseless round of worship, this central duty of monastic life, is both burden and blessing to the medieval nun, not an ideal but a reality.